PT Wijaya Karya (Persero) Tbk - WIKA Group or hereinafter referred to as "WIKA" is a reputable state-owned company in Indonesia with principal business in general construction industry. WIKA has its business activities focused in five sectors: Industry, Infrastructure & Building, Energy & Industrial Plant, Realty & Property, and Investment. WIKA was established in 1960 with the name of Perusahaan Negara Bangunan Widjaja Karja pursuant to Government Regulation No.2/1960 and Minister’s Decre of Public Works and Electric Power (PUTL) Decree No 5 dated 11 March 1960. In 1972, the Company renamed into PT Wijaya Karya. In 2007, WIKA went public and its shares are listed on the Indonesia Stock Exchange (IDX) under stock code WIKA. As of December 2015, WIKA’s shareholders are the Government of Indonesia and general public, respectively with share ownership of 65.05% and 34.95%. Achievement and performance of WIKA in 2015 shows good results achievement. According to PT Wijaya Karya (Persero) Tbk Annual Report 2015 as cited by JobsCDC.com, WIKA booked total net sales of Rp 13,620 billion in 2015 with 9.28% increase compared to 2014 which was Rp 12,436 billion. 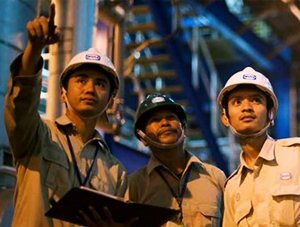 Total order booked in 2015 was Rp48,52 trillion. This reflected an 15.18% increase compared to 2014 which was Rp42,13 trillion. Civil Engineering (Structural, Transport, Environment). Occupational Health and Safety Engineering (K3). Possess a minimum cumulative GPA of 2.75 on a 4.0 grade scale (for PTN) or 3.00 on a 4.0 grade scale (for PTS). A good health history (weight balanced). Not color blind (partial / total). Good English skills (good in both written and verbal) with minimum TOEFL score of 500 or equivalent. Expertise with computer software applications in the field. Self-motivated, energetic, adaptive, and able to work in teams. Willing to be placed in all regions of operation of the company's work. JobsCDC.com now available on android device. Download now on Google Play here. Please be aware of recruitment fraud. The entire stage of this selection process is free of charge. PT Wijaya Karya (Persero) Tbk - Recruitment Fresh Graduate Program WIKA July 2016 will never ask for fees or upfront payments for any purposes during the recruitment process such as transportation and accommodation.